Now, I am not a chocolate and orange fan and after all the floral flavours in the bars I think I was finished on the flavour but the next in line was this bar and so I duly tried it and gave it the opportunity to shine brightly. Each chocolate bar is unique and the flavours added to it create a really unique union which changes the nature of the underlying chocolate. Once you add something to chocolate, you change it forever and in this case I knew this chocolate would be different than the others I had tried. The melt on this is a little better with it immediately releasing a floral flavour note as I put it into my mouth. The crystallised orange peel pieces are scattered through and aren’t too big so I find them non-offensive but I’m not sure what I think of them right now. It’s fine but as I said I’m not a huge orange and chocolate fan so I am biased. The chocolate itself is slightly drying in the mouth and not bad quality-wise. I’m enjoying it mostly. It isn’t as complex as I might go with as there are a lot of single origins with distinct citrus notes that could have been joined with the geranium and orange to really rock it but the floral note of the geranium is to powerful it is likely fine to not use a complex chocolate which might fight with that flavour. I’m not sure about this one. The flavours are distinct and strong, with the floral notes of the geranium front and centre but I wanted more from the base chocolate. I’m one person though and I would bet money people who aren’t me are going to love this bar and especially at the holidays when everything is hot and fatty and sugary sweet, this bar is going to be an oasis of delicious dark chocolate calm. 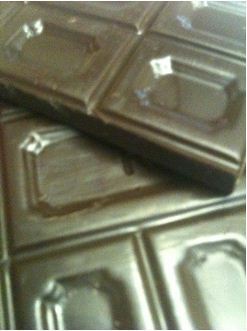 Imagine a glass of port and nibbling on this chocolate with the flavours combining n your mouth. 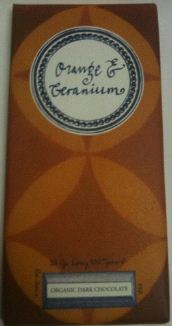 The chocolate would be enriched by the port, the orange would be complimented by it and the geranium would sit above it all. That would be a combination I’m sure that would be sought again and again.